Use the ATmega168, an AVR microcontroller, to explore the basics of digital I/O pins and useful bit manipulations. In the previous article, we looked at how to use a simple cheap USB programmer, the USBasp, with Atmel Studio 7 and WinAVR to program ATmega devices. 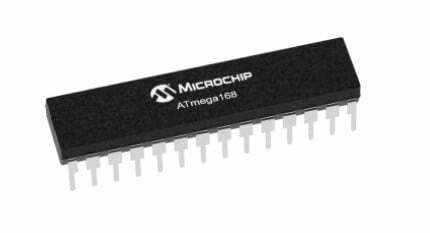 In this article, we will learn more about ATmega chips as well as the basics of I/O pins. At the heart of most ATmega devices is the AVR CPU, which is described as a RISC-type CPU. However, despite being a RISC CPU, the AVR core is arguably very powerful and has many advantages over competitor devices (such as the Microchip PIC range). For example, the AVR core contains generic 8-bit registers that can be paired to create 16-bit pointers for memory locations. 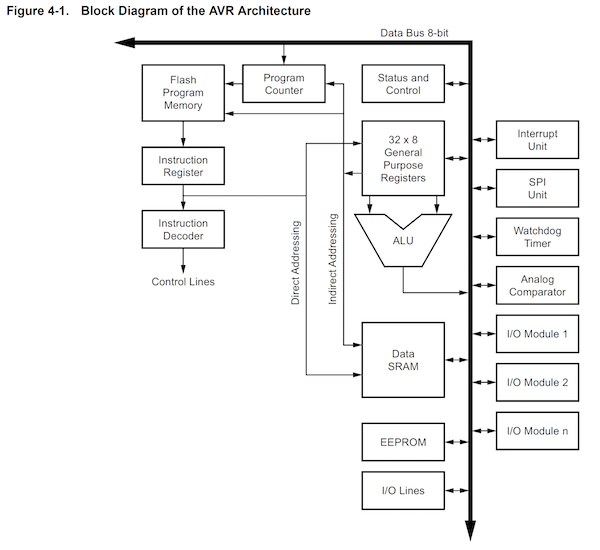 Also, the AVR core has over 130 instructions, many of which are single-cycle (thanks to the one level pipeline), and there is no banking scheme. However, AVR devices are particularly prone to bricking when users start to play with the fuses (specific chip options), which is why it is highly recommended that you have multiple AVR devices on hand. Another issue with AVR devices is their difficulty in chip programming (as compared to the PICKIT3 for example) if an official programmer is not purchased. Despite this, the AVR has become one of the most popular microcontrollers available thanks to the invention of the Arduino, which contains an ATmega at its heart. In fact, an Arduino is just an AVR microcontroller with some special boot loading code and a USB-to-serial converter. Below is the internal architecture of a typical ATmega device (in our case, the ATmega168). Knowing a bit about the internal workings of a microcontroller is good, but knowing how to make that chip talk to the outside world is great. Most microcontrollers, if not all, contain pins that allow the device to both read and write digital values to external circuits. For example, an LED could be connected to an I/O (with a series resistor), which would allow the microcontroller to turn the LED on and off. Another example would be a switch, which could be connected between the pin and power, and the microcontroller could perform an action when it detects that the switch has been pressed. Of course, the microcontroller could be connected to just about any circuit and interact with it in any way that you could possibly imagine. 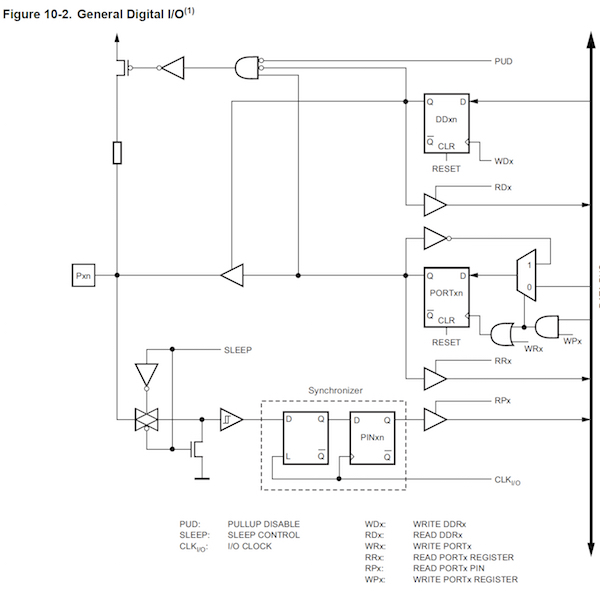 But to do this, we need to learn how I/O ports work on AVR devices and how to use them properly! The data direction register (DDR) is most likely the first register that you configure since the DDR register determines if pins on a specific port are inputs or outputs. The DDR register is 8 bits long and each bit corresponds to a pin on that I/O port. For example, the first bit (bit 0) of DDRB will determine if PB0 is an input or output, while the last bit (bit 7) will determine if PB7 is an input or output. When this is executed, all the pins on PORT B are read into dataValue, and each bit in dataValue will now correspond to the digital levels on each pin at the time the reading was taken. While this is can be useful, we may sometimes want to test individual bits instead of all the bits at the same time. In the PIC, the .bits member could be used to access individual bits, but this is not the case for AVR devices. Instead, accessing individual bits involves a bit of manipulation (pardon the pun), including the use of logical AND, OR, and XOR. To test if a bit is on (logical 1), the two following statements can be used. These functions perform a logical AND with both the PIN register and the bit (represented as an 8-bit number). If the result is zero, the if statement will not be executed because if statements only execute when the condition is non-zero. The first statement uses a binary value to represent which bit to test, whereas the second statement uses a logical shift instruction to create a bit mask, which represents the bit to be tested. The logical shift version is arguably more readable and thus easier to understand. However, the instruction may take longer to execute than the first (depending on optimization). Now that we can read from both entire ports and individual pins, how do we write to ports and individual pins? This is where the PORTx register comes in. Writing to this register (where x represents the port being written to) will result in output pins either being on or off. Remember, the physical output pins will only have digital levels corresponding to the PORTx register IF AND ONLY IF the corresponding DDR bits are set as outputs! But what about individual bits? This again is done using bitwise operators and setting/clearing bits is a little more involved. This is because we need to preserve the value of the other bits in the PORT register, otherwise, they may be changed, which could result in unexpected behavior if they are connected to external devices such as LEDs, displays, ICs, etc. In our example, we will make a circuit that toggles an LED connected to PD0 when a switch connected to PD1 is pushed. // Force a delay to prevent de-bounce! Now that we can control I/O pins, there is no reason why we cannot start to use the AVR in projects where a complex controller could be handy. Using the knowledge in this article, you could create a keypad entry system, a complex 7-segment display controller, a music system, or even a basic ’80s-style computer. Before you go off and start designing your next project, you may want to wait for the next few articles. We will learn how to use the different peripherals that the AVR contains, including timers, controllers, and ADCs! Cover image courtesy of Microchip.